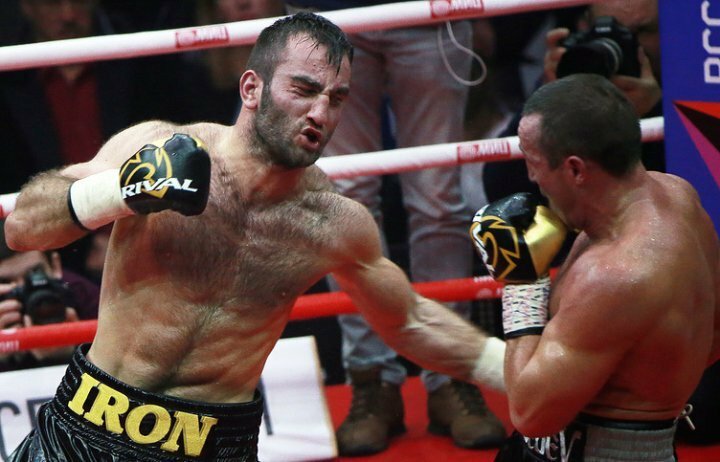 Murat Gassiev (24-0, 17 KO's) dropped, defeated Denis Lebedev (29-3, 22 KO's) by split-decision to win the IBF cruiserweight title after a closely-contested affair in Moscow, Russia. Gassiev utilized his left hook to full effect, and sent his compatriot Lebedev to the canvas in the fifth round. One judge scored the contest 114-113 to Lebedev, while the other two favoured 23-year old Gassiev 116-112, 116-111. Similarly to Kovalev vs Ward, the debatable scorecards seemed to overshadow the quality of the fight itself. Lebedev and Gassiev are made of pure granite, and it's testament to both men trading blows in a slugfest and battle for cruiserweight supremacy. IBF and WBA titleholder Lebedev, 37, whose last loss occurred in 2013 against then convicted drug cheat Guillermo Jones, used effective movement and circled around Gassiev, 23, to create full leverage for his accurate jab and southpaw shots. Gassiev, trained by Abel Sanchez, received an ear-full in each round from his trainer who noticed Lebedev's success in combating Gassiev's offence with a strong, accurate jab. He demanded a higher output and wanted his man to "be first" in the exchanges and, to his relief, the challenger implemented those tactics in the mid-round. Lebedev took rounds 1, 2 and 4, but lost the third in between as Gassiev successfully closed the distance and struck home with a series of clubbing straight right hands and, in the fifth, his crucial knockdown stemmed from a crushing left hook to the body. That knockdown was the base and should have been the core of Gassiev's 18th career-stoppage win, however to his trainer's dismay and the observer's astonish, a man who is known for his immense killer-instinct, eased off Lebedev and allowed the fight to advance through the middle rounds despite evidently hurting and tiring out the ageing 37-year old. Of course, the accurate left hooks to Lebedev's mid-section were destined to make an impact down the stretch and, in his first title fight against a strong, seasoned and established championship level fighter, the 12-round distance might have been in the back of Gassiev's mind and even contributed to his baffling low output in the round following the knockdown. Even then, Lebedev battled back like the old warhorse he is; refusing to lie down or surrender. He is made of steel and has a heart that truly puts Nicholas Walters to shame. Lebedev rallied to take the 7th, 8th rounds and notably hurt Gassiev in the 10th as a thudding right uppercut and accurate combinations hit home soon after. The scorecards of analysts, fans and observers turned out to be as subjective as ever. Lebedev's accuracy and sustainability in the earlier, later rounds secured him the vote, while others felt Gassiev's knockdown and variety were deserving factors. Lebedev, at 37, saw his tank emptied well before his late rallies but used his experience attribute that Gassiev lacks. Often enough, even the smaller and lighter shots can notify judges over the bigger, harder shots that land well but with much less frequency. The busier fighter, bizarrely, was Lebedev and his shallow shots did combat Gassiev's offence at times. Despite calls of a "robbery" in the midst of an uproar on social media, the work of Murat Gassiev was favoured by the three 'wise' men observing at ringside. Michael Buffer announced Gassiev as the victor, and he embraced with his team in what also looked to be tears of elation. The new IBF champion Gassiev moves to 23-0, while the spirited loser Lebedev falls to 29-3. A rematch is not out of the realms of possibility. Both are Russian, both engaged in a fantastic fight and a rematch is much bigger with the first fight's scorecard controversy and Lebedev's WBA title would most likely be at stake a second time around.